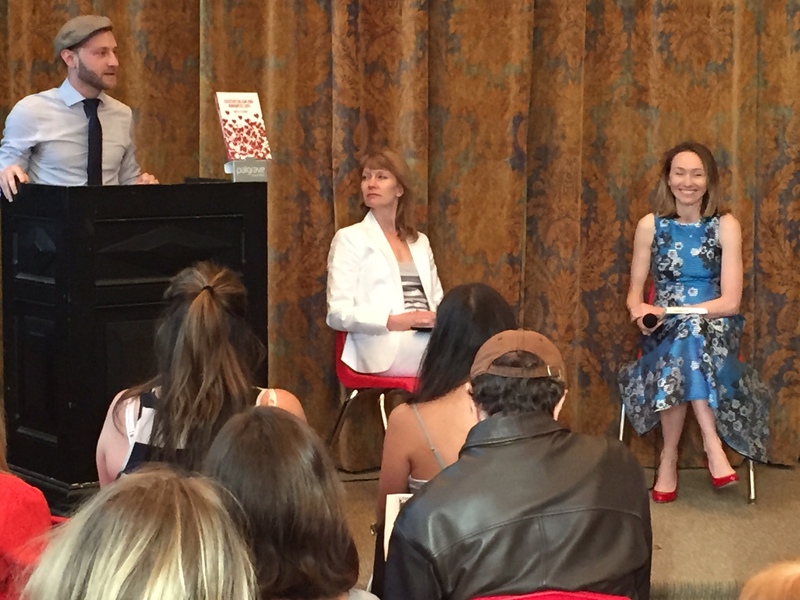 On Thursday 28th May, Committee member Skye Cleary discussed her new book Existentialism and Romantic Love in a private room of the New York Public Library – Jefferson Market location. Around 100 people attended and were lining up around the perimeter of the room while Skye was introduced by Palgrave Macmillan’s philosophy editor, Phil Getz, and then interviewed by Andrea Miller, the CEO and Founder of YourTango, in an intimate question and answer session. The pink champagne was flowing as Aussie Anita Davison of NY Cake Stylist, who also sponsored the event in conjunction with YourTango.com, treated guests to gorgeous lemon and raspberry heart-shaped cupcakes and a cake imitating the book cover. Guests also had the option of purchasing the book thanks to Columbia University Bookstore selling books during the evening. The takeaway from the evening as Skye would say: Don’t fall in love. Leap instead. Reblogged this on Existentialism & Romantic Love.